Join Today - You deserve to feel good about yourself! Paynesville Fitness Center now offers ZUMBA! Zumba will start back up May 1st. There will be no Zumba classes the month of April. 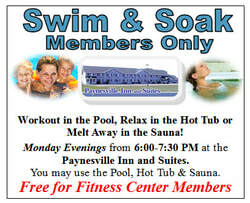 What I Like best about Paynesville Fitness Center is? "Variety of activities, events, polite/professional help, the 24-Hour usage, cleanliness, and I have NO Complaints!" "The Kids Play Areas, the number of cardio machines, and the free classes/events available to members"
"All hours access pass, free classes, kids corners"
"Not crowded. Pleasant and knowledgeable help. Diverse machines." "It is open 24-Hours and yet you still feel very secure at all times." "It is close, convenient, awesome staff"
"24-Hour Access/Classes for Circuit Training"
Quotes are taken directly from a Member Satisfaction Survey. Let us help you get fit! Open 24-Hours/Day 7 Days/Week with Access Card. Fitness Center Tours and Membership Signup is also available during regular Community Education Staffed Hours - (Monday - Friday 8 am - 4:00 pm) Please call the Community Education Office at 320-243-7570 to set your appointment. Members are still open to come 24-Hours/Day, we just want you to be aware that there will be a large number of students working out at these times. Please call us at 320-243-7570 for more information. Membership rates are for one-year agreement memberships and must be paid by Electronic Fund Transfer from a checking/savings account or paid in full. One-year membership agreements move to month by month memberships that can be canceled with 30 day written notice. Month-By-Month No Contract Memberships are also available. Please call us at 243-7570 for more information. Definition of a family: Members of an immediate family (Married adults and any children under 18 or children whom are full time college students age 22 and under living in the same household.) Students under a family membership must be at least 16 years of age to utilize the fitness center during non-staffed hours. Children 10 -13 may use the fitness center if parents have a family membership and the child is with them the entire time. Call Matt at 243-7570 for more information about Silver Sneakers and Silver and Fit. 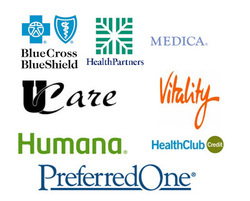 Paynesville Fitness Center partners with the following major insurance companies that offer fitness reimbursement programs with specific insurance policies. You may contact your insurance company or a membership associate to find out if your policy qualifies.